Stretches of sandy beaches and nearly 50 percent dense forest cover the beautiful landscape of the Southeast Asian country of Myanmar, also known as Burma. But after decades of isolation under a military dictatorship, this predominantly Buddhist nation of 56,890,418 is undergoing a dramatic shift, politically, economically and socially, and rapid deforestation due to increased agriculture, logging and mining could have a devastating impact on the environment. While the nation has been moving in a positive direction—electing its first non-military president in 2016 in half a century—the military still holds influence and is being investigated by the UN Office of the High Commissioner for Human Rights for atrocious attacks on Rohingya Muslim, an ethnic minority. Throughout the 19th Century, Burma was at war with and a colony of Great Britain. The country achieved Independence in 1948, and U Nu became Prime Minister until a military coup in 1962, lead by Gen Ne Win, overthrew the government, replacing it with single Socialist Programme Party. Under Gen Ne Win the economy was nationalized and the media was tightly controlling and censored. In the ‘80s, the party restricted the rights of minorities and non-indigenous peoples, stripping them of full citizenship and the right to vote. Seeds of democracy for the nation were sewn in 1988 as Aung San Suu Kyi led pro-democracy protests and the founding of the National League for Democracy. Efforts were stifled however, as the military junta cracked down on protestors, killed thousands and put Aung San Suu Kyi under house arrest. Despite multiple uprisings and elections supporting the National League for Democracy over the few next decades, the military remained in control, violating human rights and drawing criticism and economic sanctions from the US and Europe. Hundreds of thousands have been displaced due to religious persecution and extreme weather. Junta control eased up in 2011, followed by a series of progressively more free elections. The now-free Aung San Suu Kyi currently serves as State Counselor because law prohibits her from being president, but she closely works with President Htin Kyaw. Year-round Buddhist festivals are a large part of the culture in Myanmar. 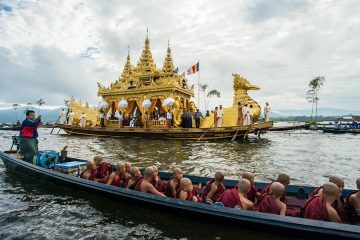 One of the largest is the three-week-long Phaung Daw Oo Pagoda’s Festival at Inle Lake, featuring dances and rowing competitions. The five-day Shwedagon Pagoda Festival is an ancient religious ceremony centered around a sacred golden pagoda that houses Buddha relics, where pilgrims come and leave gifts and donations. When it comes to cuisine, rice is the staple in Myanmar. Seafood and local curries are also widely consumed thanks to geography and the influences of various ethnic groups and neighboring India and China. People gather on the floor around low wooden tables to eat, and while utensils are increasingly more common, it’s customary and perfectly polite to use your fingers. The most popular sports in Myanmar include several different systems of martial arts, as well as Chinlone—a hacky sack-like game where you have to work together to keep a rattan ball in the air without using your hands. Football (soccer) is also fairly widely played and watched. I think the place is really cool! All the gold is beautiful! it’s pretty cool to see all the pagodas! I was a little upset today by part of your presentation on this. I have Buddhist friends and a very deep respect for Buddhists. I’ve read the Buddhist Sutras and am relatively well versed in Buddhism for a Christian. However, I was disappointed when the journalist said he was going into a Buddhist Temple to “pay homage to Buddha.” I didn’t have a problem with that by itself. But my fear is that you’d never have a journalist go a Catholic Church and say I’m going to “pay homage to Jesus Christ.” Frankly, I’m not sure if you’d ever have a journalist say I’m going to “pay homage to Allah” either. Now I really do believe prayer should happen more in schools, so I enjoy the respect for all religions and even observing the practices of other faiths. I believe ecumenism is critically important in our divided world. But my fear is that there is an inequality in your approach. And that inequality will only create a deeper division and undo the work for unity that I assume is your desire. So I absolutely applaud you in showing the religious practices around the world. Please continue to do that. Please don’t skip over Christianity.